The new semester begins Aug. 17 for more than 28,000 students at Grossmont and Cuyamaca colleges with the continuing trend of additional class offerings and higher enrollment at the two East County colleges. The two colleges are offering more than 2,400 class sections this year, almost 5 percent more than last fall. Enrollment at Grossmont is expected at about 19,000 students, up 4 percent from 2014, while enrollment at Cuyamaca College is projected at about 9,200 students, a 5 percent increase. Students still have the opportunity to register for fall classes, with the colleges continuing online registration through Aug. 16. Schedules and registration links are available at www.gcccd.edu/now. 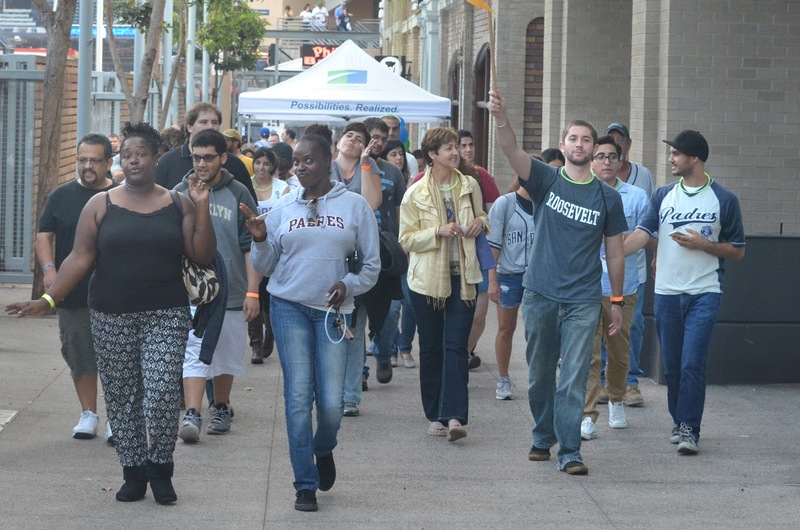 The fall semester approaches with higher enrollments anticipated. 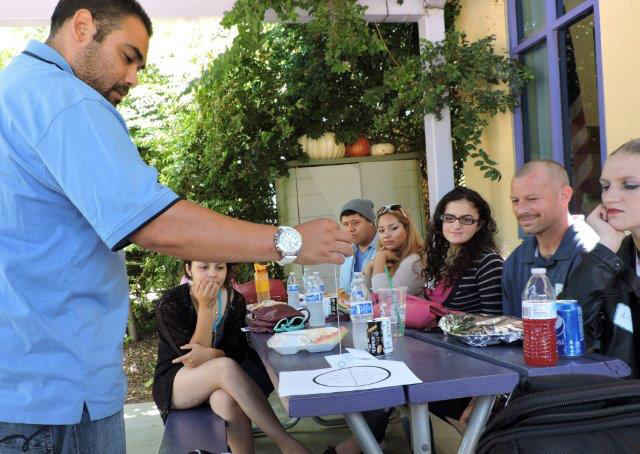 Cuyamaca College has joined a national consortium dedicated to improving student success among men of color in community colleges. The Rancho San Diego college joins its sister campus, Grossmont College, and about 50 other community colleges and universities across the country in signing on with the National Consortium on College Men of Color, a project of the Minority Male Community College Collaborative, also known as M2C3. 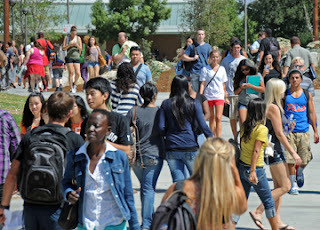 If you’re thinking of going to college, Grossmont or Cuyamaca College might be the place for you. With helpful faculty and staff, high educational standards and reasonable prices, pursuing a degree at Grossmont or Cuyamaca College makes a lot of sense. Here are 10 reasons why. 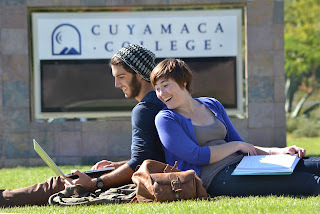 Once you’ve read this, you’ll realize that Grossmont and Cuyamaca colleges are the right choice for you. Apply now at Cuyamaca College or Grossmont College for the fall 2015 semester! 1. Cost. At just $46 per credit, the Grossmont-Cuyamaca Community College District offers among the best educational bargains in the country. You can save thousands of dollars for your education by attending community college instead of a university. 2. Convenience. Grossmont College in El Cajon and Cuyamaca College in Rancho San Diego are conveniently located in San Diego’s East County, and both are easily accessible via Metropolitan Transit District bus lines. 3. Smaller classes. Would you rather sit in a classroom with fewer students where the professor knows your name and is willing to meet with you when you need help; or would you rather sit in a large, anonymous lecture hall where you’re little more than a number? If you prefer the former, welcome to Grossmont or Cuyamaca College. 4. Veteran-friendly. Both Grossmont and Cuyamaca Colleges have earned distinction as veteran-friendly campuses . Both campuses offer a variety of services to former servicemen and servicewomen, including priority registration, veteran resource centers, and veteran’s counselors. About 20 students in a Cuyamaca College program that supports former foster youth or those raised by guardians received school supplies and vouchers for books and transportation from the El Cajon Elks Lodge Wednesday, marking the second year of the group’s donations. 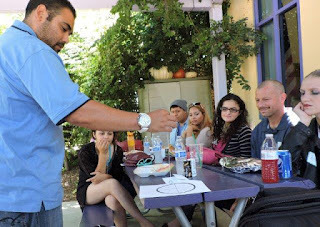 At a barbecue luncheon provided by the Elks Lodge at the Water Conservation Garden at Cuyamaca College, the students heard a motivational talk by Martin Barros, California/Hawaii Elks Association vice president. 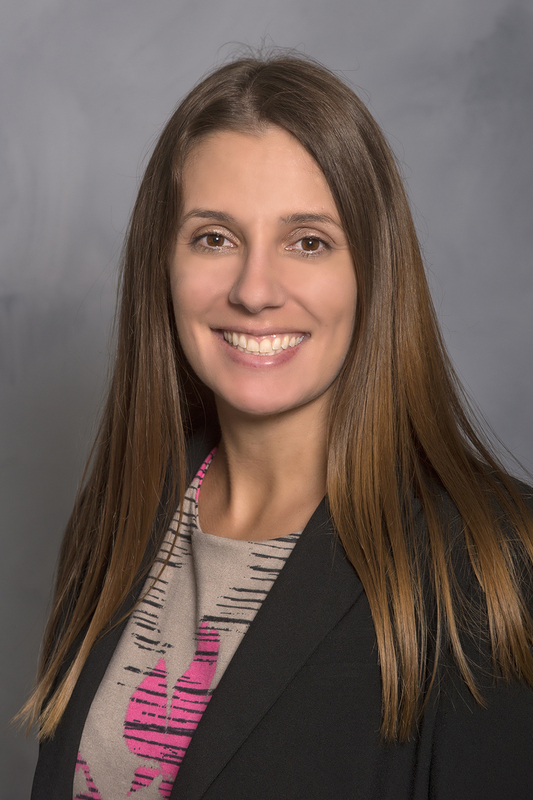 Breanna Baer, a former national director for The Leukemia & Lymphoma Society, is the new director of development for the Foundation for Grossmont & Cuyamaca Colleges, the philanthropic partner for East County’s two community colleges. The Oceanside resident, who focused on building large corporate partnerships for more than a decade fundraising for LLS, will connect with potential corporate and individual partners for the foundation. Baer will also oversee the foundation’s efforts to find new ways to engage the community in fundraising efforts. Would you like to volunteer at the Intergenerational Garden? For seniors wishing to work with children in the garden and classroom, contact Jamillah Bakr at jbakr3@gmail.com. To volunteer for a weekend work day once a month, contact Cindy Emerson at cindy.emerson@gmail.com. The next work day will be Saturday, Aug. 8 from 7 a.m. to noon. at the garden, next to the Child Development Center at Cuyamaca College. The East County Intergenerational Garden at Cuyamaca College is a place where preschoolers can learn about how food is grown and to enjoy healthy eating, all with the help of local senior volunteers. 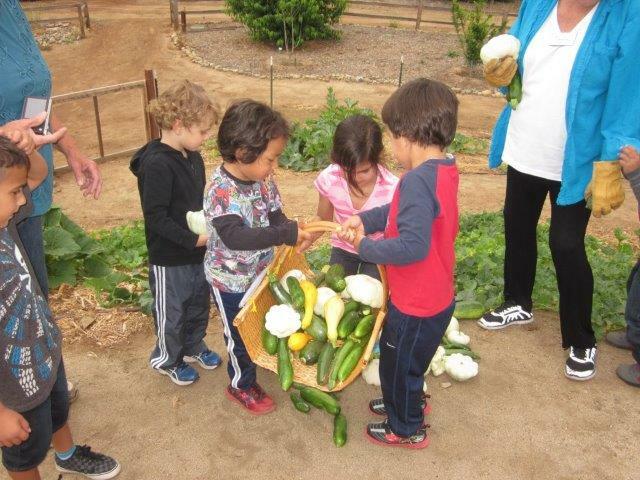 The garden, located on 1/3 acre adjacent to Cuyamaca College’s Child Development Center, produces a variety of fruits and vegetables, including avocados, apples, nectarines, asparagus, strawberries, ornamentals and many vegetable crops. Pumpkins and squash are harvested at Pumpkin Hill in the center of the garden. Some are sewing gowns for the ball. A few are up on catwalks setting up the lighting that will illuminate the stage. Others keep busy building the sets, tools in hand and ladders at the ready. 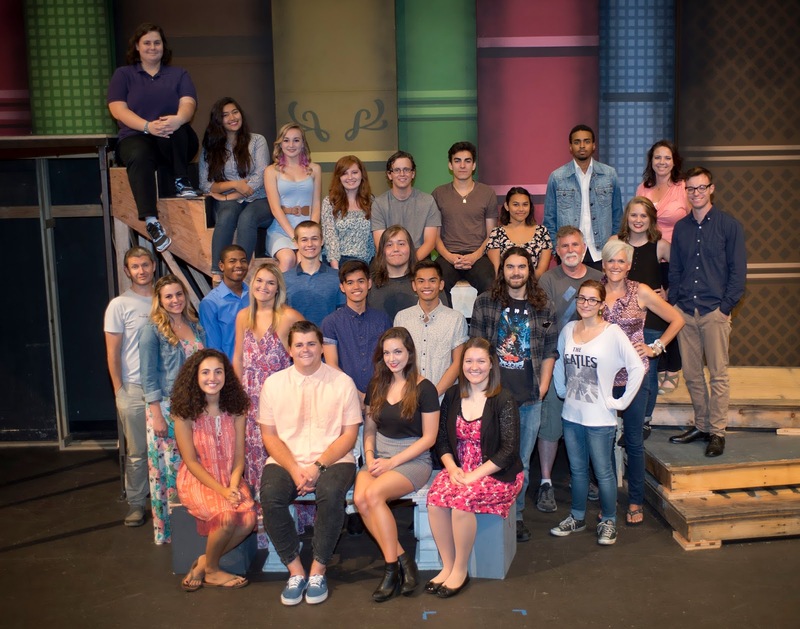 Welcome to the Grossmont College Theatre Department’s 2015 Summer Conservatory, an eight-week course where high school students work side by side with their college counterparts doing everything from stagecraft to acting in a unique program that culminates with Cinderella - A New Pop Musical from July 23 through 31. All of the students – high school and college, actors and stagehands – earn college credit for the course that began June 8. Mario Chacon decided it was time for a break. After a quarter century in academia, the community college administrator opted to further explore his artistic talents. “I decided if I didn’t do it, I may not get another chance,” Chacon said. That was in 2007. 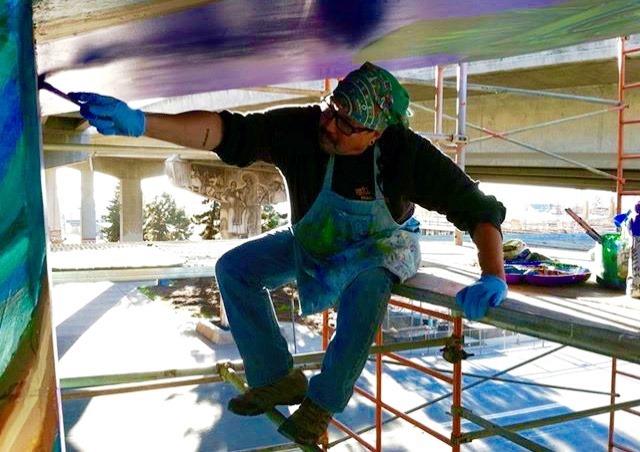 Since then, Chacon has helped restore two historic murals at Chicano Park in San Diego, crafted several canvas paintings, and illustrated a book. He also has been active creating works for various gallery exhibits. 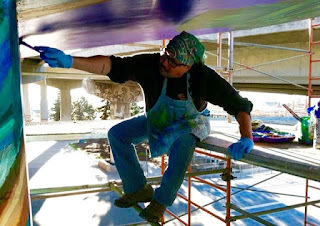 His latest piece is a colorful mural on a 30-foot wall at Paseo at COMM22, a 130-unit affordable housing complex that opened this spring near a trolley stop in Logan Heights. “I feel that my remaining time in higher education will be filled with a more creative spirit,” he said. Spending eight hours everyday on intense study in a classroom may not be how many teens envision launching their summer vacation. Just don’t tell that to the 13 high school sophomores, juniors and seniors who began a prestigious, 8-week, Life Science Summer Institute program with 40 hours of training at a Grossmont College `boot camp’ to prepare them for working the rest of the summer in paid internships at The Salk Institute for Biological Studies, the Scripps Research Institute and UC San Diego. 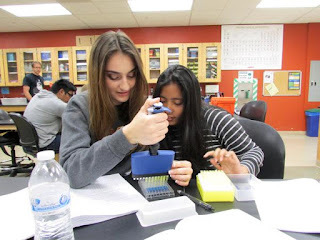 After completing the boot camp, Fowsia began her internship at Scripps for nearly two months of neuroscience research. 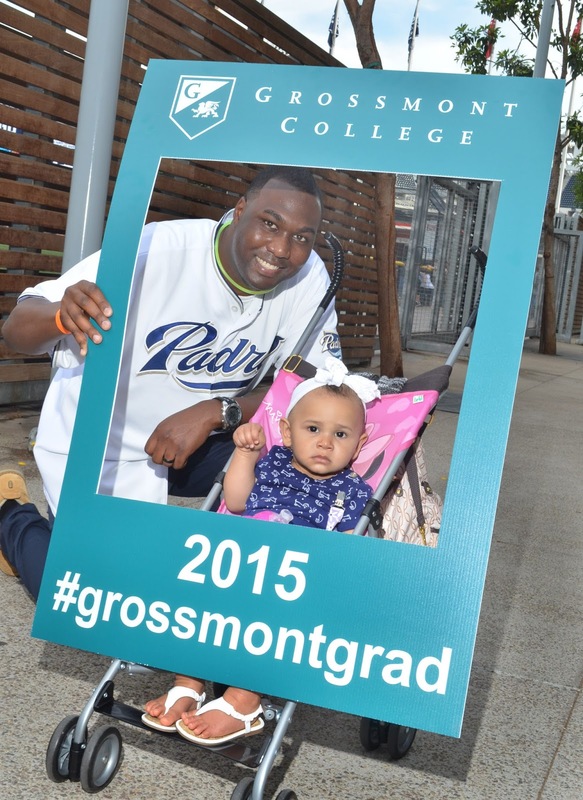 More than 400 graduates of Grossmont and Cuyamaca colleges and their guests celebrated Tuesday night at GradFest, an event put on by the Foundation for Grossmont & Cuyamaca Colleges. The grads met at Rare Form, Fairweather & Stone Brewery, located by Petco Park, then headed over to the ballpark to watch the San Diego Padres play the Seattle Mariners.